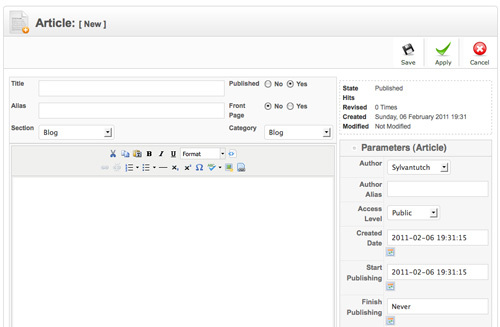 You can add new Pages to your website by clicking the New button in the toolbar whilst Managing your Pages. Title: This is the title which will appear at the top of the page, and as a link in a list of pages (such as in your Latest News section). Published: Set to 'yes' if you want the page to display live on the website. Set to 'no' if you only want it to visible in the administration system (whilst you are working on it for example). Frontpage: If you have the ability to set items to appear on your homepage, set this to 'yes'. Create the content of your page in the main text box. For more information see Editing Text.